After a run of four defeats in a row, obviously we are very disappointed at the moment. I feel that we probably deserved to take something from each of the first three of those four fixtures, but in our most recent game with Ashton United, we were poor. We couldn’t cope with that aerial presence and the power of Ashton and the better team on the night won the match. In the opening 45 minutes we struggled to come to terms with a powerful, direct opponent and a headwind in our faces. We did a bit better in the second half, but we just weren’t good enough to warrant a result. 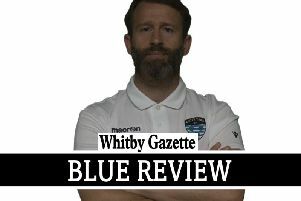 On Saturday, the officiating was probably as poor as I’ve seen it since I’ve been at Whitby. Some of the stuff going on from Rushall was quite close to the bone. They were quite heavy-handed, they play to their strengths, they’ve got good qualities but I thought our boys did well to stay on the game in hand and not get drawn into other nonsense that was going on. While the recent form is clearly a problem, it’s not all doom and gloom. When I came to the club I knew that it was going to be a big challenge to beat relegation, and this remains the case, but there are still plenty of fixtures left to play and I feel things are still in our own hands. It is important to remember that we have a game in hand over Stamford, the team who are just one place and one point above us. We travel to Barwell on Saturday and it will be important for the lads to start that game well. We need to be at it from the word go and produce a performance worthy of some points. When you are winning games that breeds positivity, but when you are on a losing run things become much more difficult and it’s up to us to turn it around. A supporters’ bus leaves the Turnbull Ground for Barwell at 8.30am on Saturday. Call chairman Graham Manser on 07966 241344 to book a place. The Blues are also holding a fundraising quiz in the clubhouse on Wednesday March 9, 8pm start.